Maximum limit of 50 brochures allowed per order. This colorful brochure allows you to share with others the advantages of the Weekend to Remember(R) marriage getaway. Included are dates, locations, rates, and group information for the February - June 2019 season. 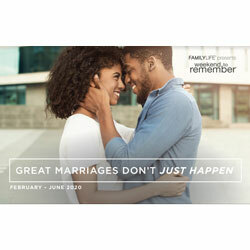 The booklet includes an invitation from FamilyLife President David and Meg Robbins, shares the benefits of the getaway, and gives several poignant quotes from recent guests.